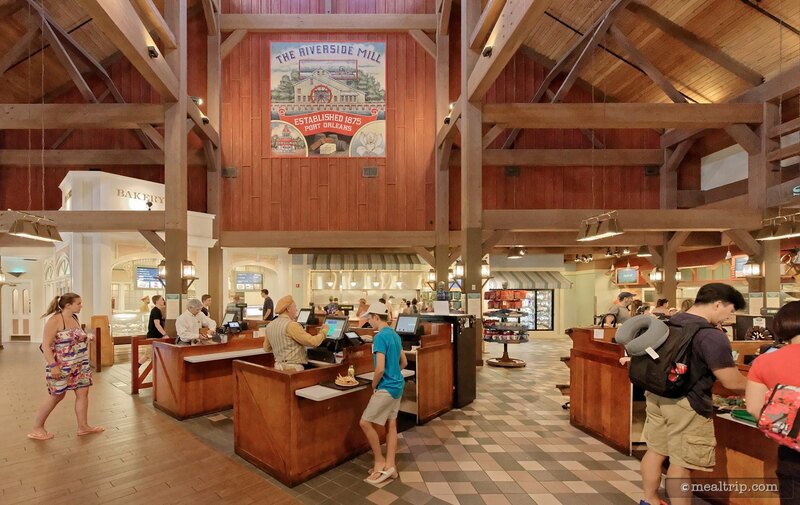 At Port Orleans/Riverside, the main counter service dining location is aptly named The Riverside Mill Food Court. 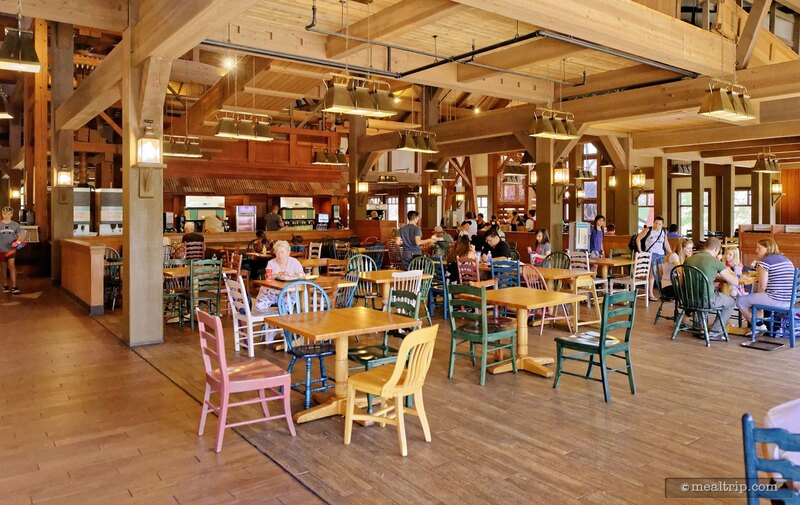 In the center of the large and open main dining area, you will find a working cotton mill wheel, that’s powered by flowing water outside the restaurant. Even though the space is very large, it can get crowed at peak times. There are usually seats available though. The large beam woodworking that adorns the area can sometimes make it difficult to see all of the seating without walking around a bit. 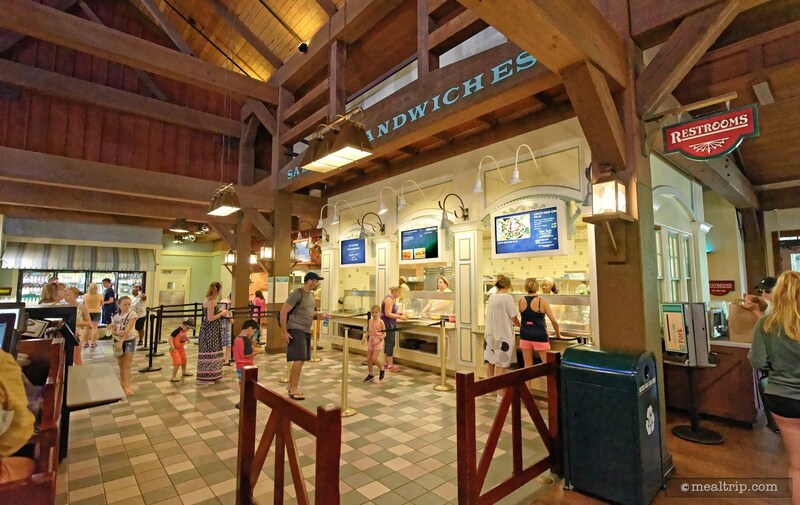 Food-wise, like all food courts on property, selections are plentiful, and include made to order pasta, flatbreads, salads, and the standard chicken and burger type sandwiches. Thankfully, there are a few entrees that are inspired by the New Orleans theming as well, like the Shrimp Salad Po’ Boy and Muffaletta. The lunch and dinner menus are largely the same. However the dinner menu adds three fresh carved plates. Sliced beef, turkey or ham is usually accompanied by two additional sides (that change from day to day) and cornbread. 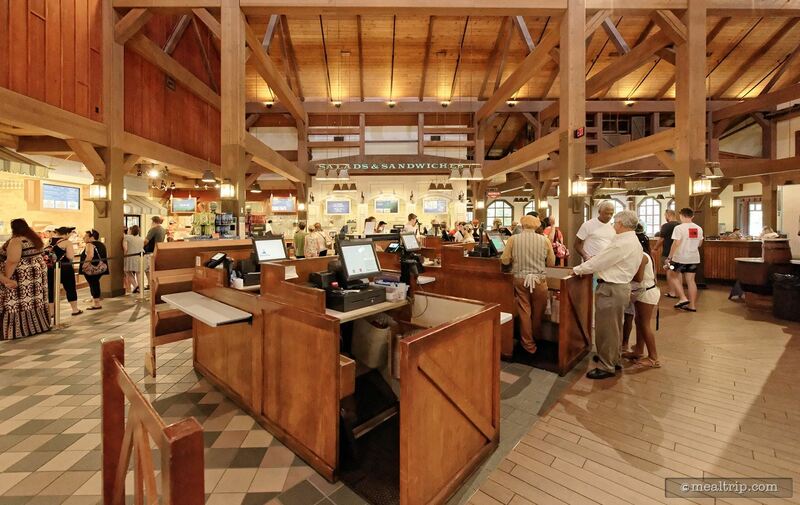 There are two and a half places to eat at Disney's Port Orleans Resort — Boatwright's is a table service restaurant that is only open for dinner, our "half" place to eat is a great piano lounge that goes by the name of "River Roost Lounge" (it's only a "half" because they have a small bites menu from 5pm to 11pm), which leaves us with the Riverside Mill Food Court. 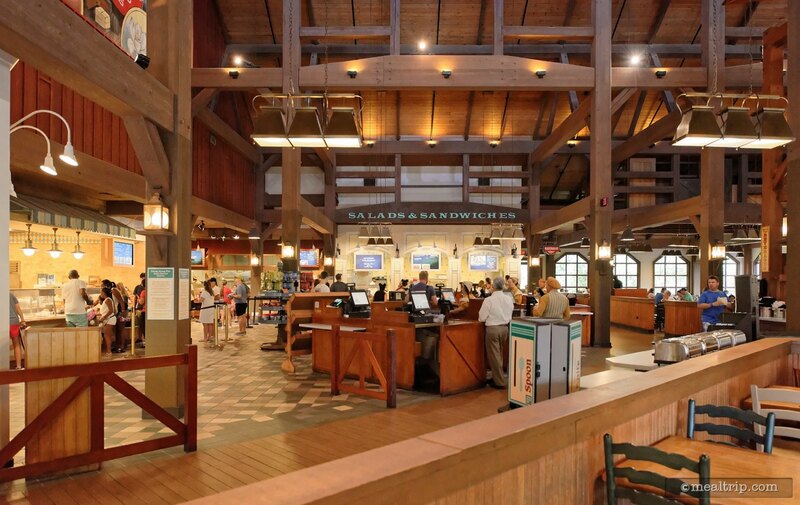 It's a big food court — and it's open from 6:30am to 11:00pm (give or take depending on the season), and serves breakfast, lunch, and dinner. The breakfast menu contains breakfast-like items, while the lunch and dinner menus are basically the same. 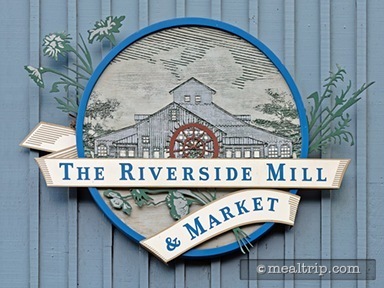 The really unique thing about the Riverside Mill Food Court is that the seating is all basically all right in what "could" be a working cotton press or grist mill. Now, Disney's not actually pressing cotton or grinding corn or anything, because that would kick up a ton of dust and debris — but still, it's pretty cool. 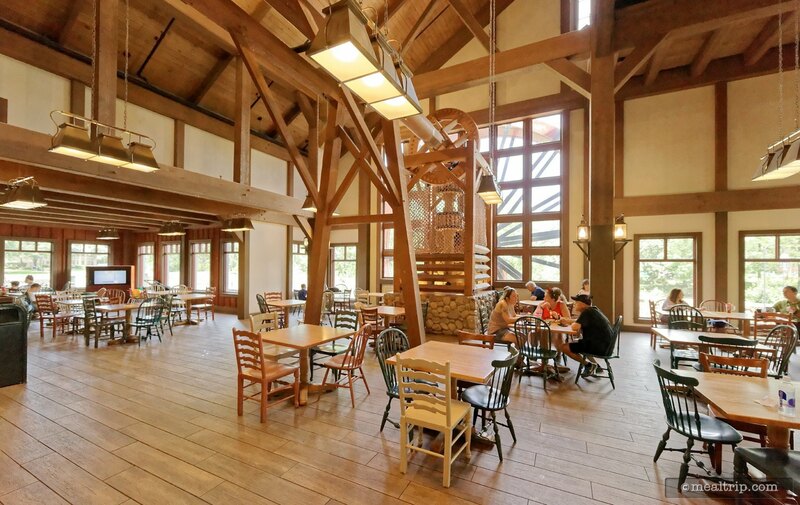 Outside, there's a wooden slues (channel of water) running over and pushing a giant wheel, which in-turn rotates a giant wooded shaft that comes right into the restaurant, about 15 feet up in the rafters and over the beverage station. Right about where the ketchup is located, the rotating column stops and it is here — where (if this was a "real" working cotton press) a geared vertical column would come down and wind cotton into tight bales, which would then be sold at market. It's kind of too bad that the whole thing is so high up in the rafters, because you might step into the place and not even notice any of it's up there. I kind of wish they would have connected it to some kind of large articulated piece of art, like a giant baby mobile or something flashy, so anyone that wanted to — could take a second an figure out all of this was going on — right in the middle of the seating area! 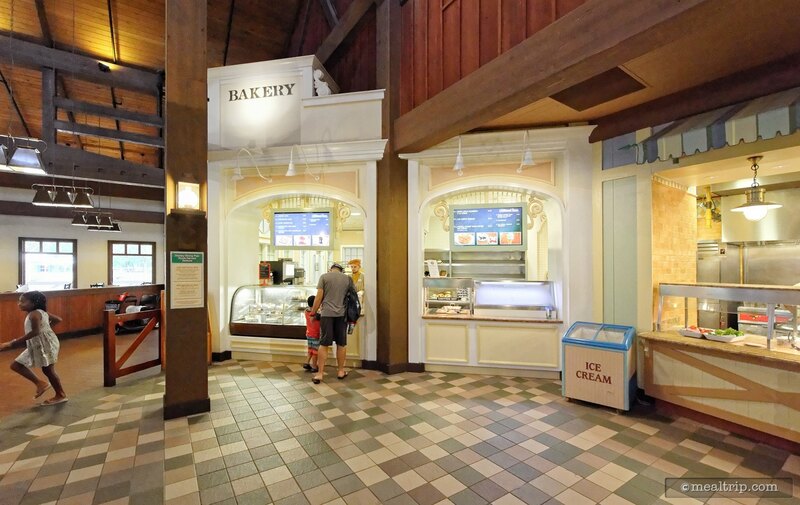 Getting back to the seating area, it's a pretty typical size for a Disney food court location. Because there's large wooden columns everywhere, it's not really "open" looking but there's five or six separate seating "areas". 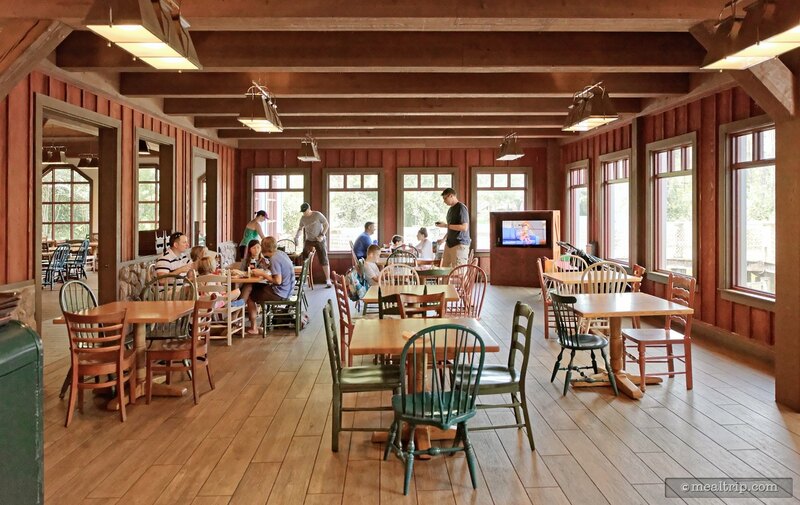 The location is not "quiet" even when nearly empty — mostly because of the high ceilings and all of that wood. Because the resort is a little further away from the parks, it might not see quite as much action after breakfast right up until parks start closing. The breakfast period, is usually packed full of guests… then around typical lunch and dinner times there might be an increase of guests. 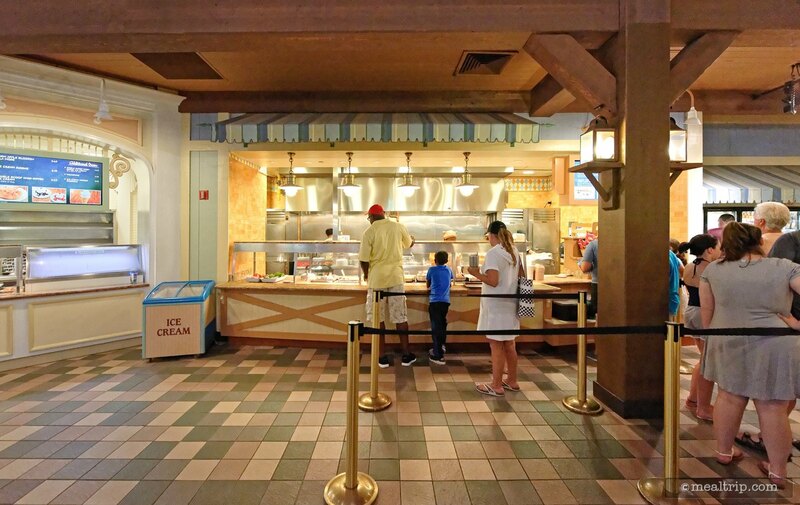 The photos of the dining and food service area that are in our photo gallery were taken at around 2pm — and it didn't seem all that crowded. 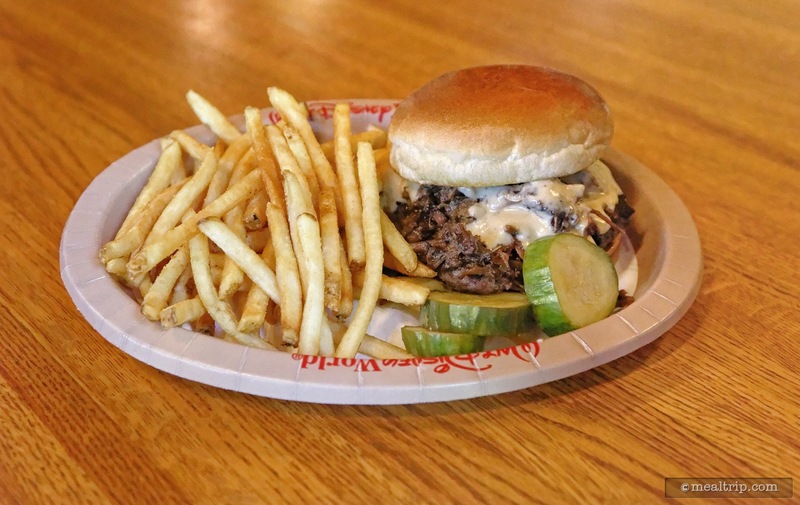 Even though the nearby Sassagoula Floatworks (the Port Orleans - French Quarter counter service location) has switched to using melamine (heavy plastic) plates and proper silverware — they're still using paper plates and plastic utensils here at Riverside Mill. Plating isn't everything of course, but it does kind of make you think differently about what you're getting. 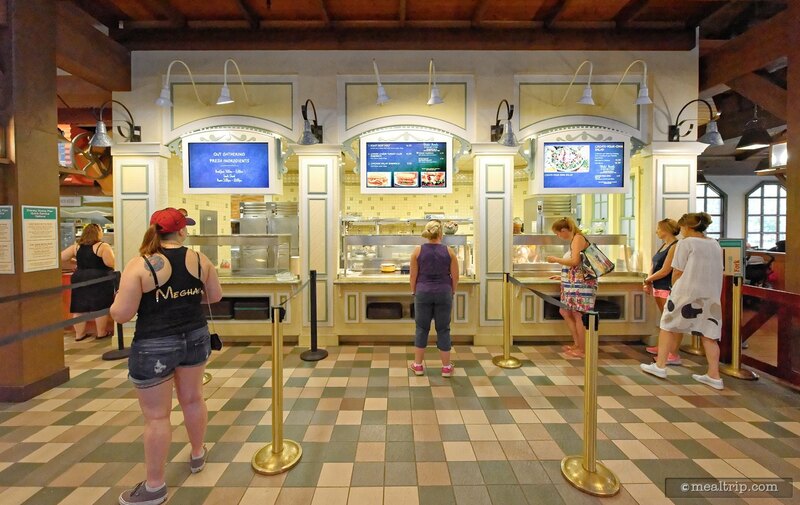 I've found that most Disney food courts offer the same type of food items — a couple of hot sandwiches or plated entrees, some cold sandwiches, pasta station, a salad or two and maybe a soup, a couple of pizzas, and a pastry or dessert counter. What makes each one unique is a slight culinary nod to the theming of the resort in at least one element or garnish on each item. A unique sauce, or vinaigrette, a themed cheese on the burger, a spice note here and there. 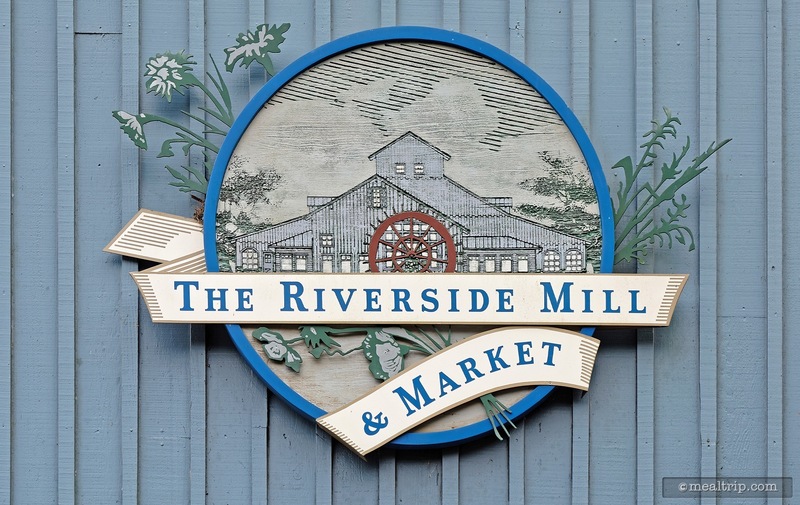 The Riverside Mill doesn't deviate from this basic formula. On my most recent visit, I tried out one of the New Orleans themed burgers — aptly named the "Bayou Burger". 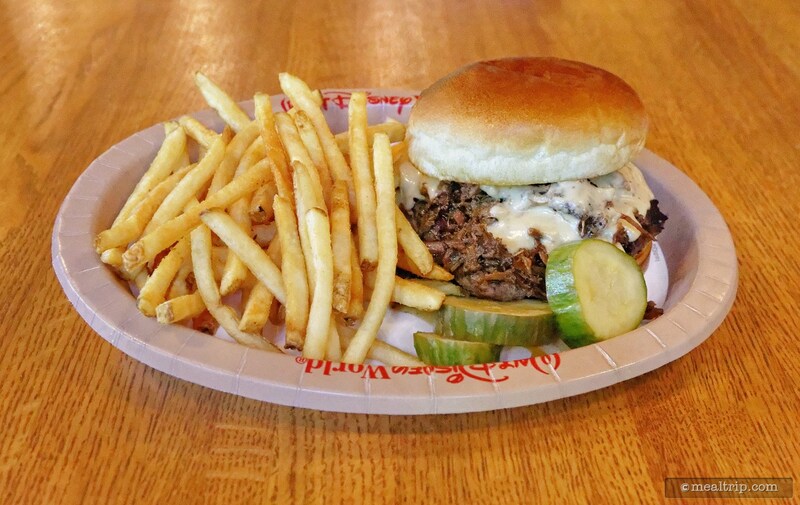 This one starts out with a typical counter service burger (it's not one of the fancier hand-packed artisan patties that you'll find at table service locations) — but the Bayou Burger is topped with Chopped Braised Prime Rib! The prime rib was slightly smoked (which may have been a smoked salt in the mix somewhere, but I can't be sure), and it really did make the counter service hamburger patty juicy, more flavorful and just — better! On top of the prime rib, there was a couple spoonfuls of Abita Beer Fondue (a beer-based cheese sauce) — and honestly, you can't go wrong with a beer cheese sauce on top of — anything really! The burger was a little messy, but worth destroying a half dozen napkins for. It was served with house-made pickles, which were pretty great as well. They really hadn't been "pickled" for very long, acting more like thick cut, crisp cucumbers — but with a fresh and light (for a pickle) garlic notes. Most of the hot and cold sandwich options at Riverside can be served with Coleslaw or French Fries — clearly I went with the fries. At Disney though, the french fries are about the same everywhere — and aren't bad, but just lack any real "wow" factor. For dessert, I tried out the Warm Apple Blossom à la Mode — which was okay. I think for the price, the apples could be fresher, there could be a bit more in the spice (cinnamon) department, and honestly, a little caramel or butterscotch in the sauce of the blossom itself would go a long way to making this a "wow" dessert option. 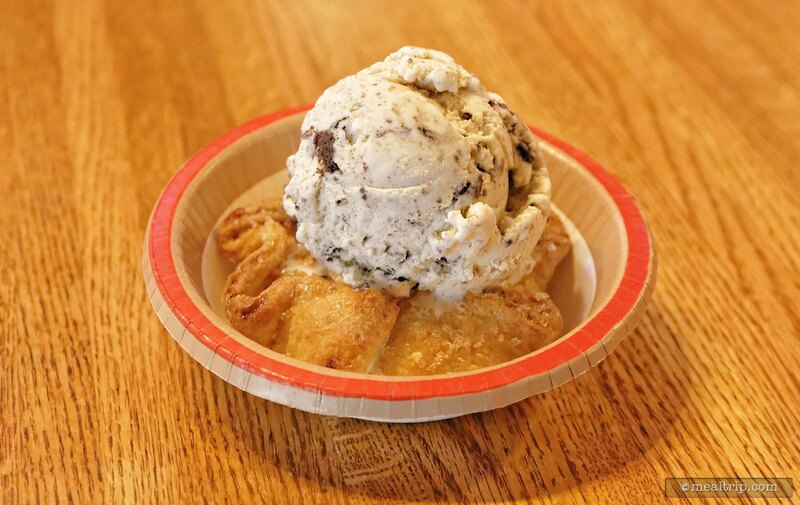 It was good, but we've had some "great" desserts at counter service locations before. Soft drinks are self-serve here, and it's worth noting that (like most counter service locations at Disney now) an electronic refill chip is embedded in the bottom of your cup — which (if I'm not mistaken) gives you four fill-ups over a 90 minute period. All in all — it was a great burger (comparing it with other counter service burgers) and a good dessert. Would I go out of my way to get this culinary combo? Probably not, but if you're staying at Port Orleans Riverside, or even the nearby French Quarter, it's a good option and totally worth a visit. While you're there — don't forget to look up above the beverage station, at that really cool giant rotating column of wood! Then before or after your meal — take a quick walk by the giant paddle wheel outside. This whole thing used to be a state of the art machine 200 years ago. We've come a long way! CLICK HERE to view all 18 images in our photo gallery.